With the lack of ice in many areas last winter my ice fishing days were very numbered. They even cancelled the SnoBear Migration on Lake Winnipeg because of the “iffy” conditions. Because of that, and because I had left the Ranger down in Florida, I had a good excuse to go back down south so my wife and I headed back down to Florida for six-days of fun fishing. It’s nice to just get away and go fishing without having to shoot TV stuff, do a tournament or have another type of commitment. On these six days there was no commitment, we were just going fishing. We were stationed in Lake Placid, and Clay Lake was behind the hotel we were staying in. It’s a fairly small lake but it’s got a great boat launch so we decided that it would be a good spot to go out and have some fun. On day one, Dave Johnson joined us and we caught a few fish here and there before coming across some isolated weeds just off of a boat dock. I threw out a Berkley Havoc Grass Pig and got a hit, set the hook and ended up landing a largemouth that was over eight-pounds! As much as people talk about the giant bass of Florida, I have fished there for over three decades and catching eight-pound fish is not as easy as you might think. 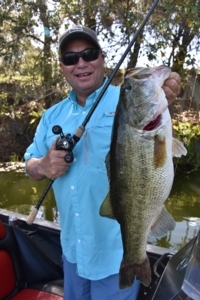 Florida does cough up double digit fish every year, but with the amount of year ‘round fishing pressure they’re under, an eight-pounder is a very respectable bass down there. On day two we met Dave at the south end of Lake Okeechobee and proceeded to catch 30 or 40 bass, primarily on swimbaits cast over the flats. It was a great day and we all had lots of fun down in South Bay. On day three a friend, Leo Capobianco, flew in to Florida to join us for a couple of days of fun fishing. On the first day we fished three different lakes in the Lake Placid area that I’d never been on before and we caught a lot of fish, but no big ones. The next day we decided to head back down to Lake Okeechobee early in the morning and, once again, we caught 30 or 40 bass in the south end of the lake using swimbaits. Then my wife and I packed it up and headed over to Bartow, Florida to fish some of the waters at Streamsong Resort. Recreational Director, Tyler Ramsdell, had invited us to go check out some of the lakes on the 16,000-acre Streamsong property. Our good friend, Ward Edmonds, flew in to join us and we fished our brains out. 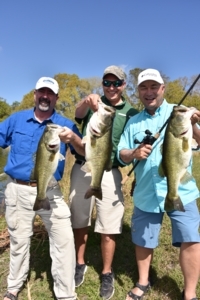 In the course of two-days we fished about five different phosphate pits and ended up catching over 100 bass each day. I would say that at least 80 of them were between four and eight-pounds. It was absolutely incredible fishing and I’ll definitely be going back to Streamsong Resort next year. Then it was time to haul the boat and truck back to Ontario as I had two seminars to do at the Toronto Sportsmen’s Show. They moved the show date back into March and the location to the International Centre in Mississauga. The show was very reminiscent of the way it was in the 80s, when it used to be at the old CNE grounds. It was absolutely jammed and you couldn’t even get a parking spot without waiting in huge lineups just to get into the lot. It was absolutely a happening and very busy show. Then it was time to get some work done around home base, tape some radio shows, work on production and a few other things before getting back on the road for a little drive down to the great state of Texas. Canadian fishing guide, Joe Ford, guides down in Texas for a few months every year on Lake Fork. Lake Fork is a renowned big bass fishery and it was exciting for me as I’d only been there once, back about 20-years ago. Well, we fished hard for two and a half-days but didn’t get any quality fish. It just seemed like we missed the bite. Joe had caught fish just under 10-pounds prior to us getting there but we hit a bit of a cold front and things just weren’t happening for us. As a result it turned out to be one of those trips that you’ll never see on TV because we just didn’t get enough fish to make a very good show. It was the old, “you should have been here last week” or “you should have stayed for a few extra days” scenario. The irony is, just as we were getting ready to leave the big bass started moving up onto the beds in droves. We went into one cove the last day of fishing and every 40-yards there were guys fishing bedding fish. Seven, eight, nine, ten-pound fish were being caught but we just ran out of time. These types of trips humble you a bit but I guess if they all went good every time it would be called “catching” instead of fishing. Oh well, it is what it is. Then it was off to Oklahoma to my buddy, Dave Smith’s private lake. When I say private, there are only five or six properties on the lake. Dave’s got a fishing lodge there that he keeps as a bit of a getaway. We decided we weren’t going to shoot any video; we were just going to have some fun. As it turned out, we caught 60 or 70 fish up to about six-pounds, including lots of four and five-pounders. It would have made some great video but, even though we didn’t shoot any, it was a fun two days of fishing. And that was that for our down and dirty fun fishing trip. When we got back home I had a dentist’s appointment, I got some maintenance done on the vehicle and I did some more radio taping. Then a friend, Steve Joyce from Fox Harb’r Resort, invited us to the Lake Ontario Waterkeeper gala event in Toronto at the CBC headquarters. It was an incredibly fun event and a lot of money was raised for this great cause. Then it was time to pack up and head to Georgian Bay on our maiden voyage with the new Ranger Z522D bass boat. This boat is definitely the finest big water bass boat I’ve ever been in in my life. It is a spacious, soft riding, deep boat that will handle whatever the Great Lakes can dish at you. Local guide, Blair McCaffrey, joined us for two days of fishing up there. He guides out of Pleasant Cove for owner, Bruce Bishop. We shot a show and caught some big pike up there about 15-years ago so it was fun to get back up to Pointe au Baril and get out fishing on Georgian Bay. We saw some really big pike and we caught a lot of pike – but we didn’t catch any big pike. We did catch an eight-pound walleye on a Berkley War Pig crankbait, which was a nice bonus. 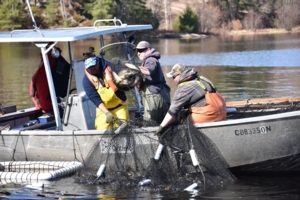 We also met up with a Ministry of Natural Resources group who were netting some spawning walleyes and we had the chance to film them netting, measuring and tagging some walleyes up to 12-pounds. I had a very good conversation with the MNR folks and also spent some time in the evening with them. They told me that the population of walleyes up there is very fragile so if you fish for them you should consider putting some of the bigger fish back. I realize they’re good eating, but the best way to help sustain the population up there is to release the big spawning fish. Then it was time to get the smallmouth stuff ready and head to Wisconsin with my friend, Derek Strub, for the annual Sturgeon Bay Open. Derek keeps a record of every day he fishes and he has detailed notes on every one of our practice days, every one of our finishes, the wind conditions, water temperatures and all those things that really good anglers should keep track of. I’d do it myself but I’d wear out too many pens and too much paper if I did that! We headed to Wisconsin with high hopes but in all the years we’ve fished this tournament the conditions have never been the same. 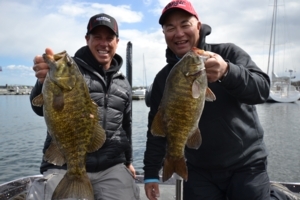 When we got to Sturgeon Bay on Lake Michigan the water temperatures were cold and the fishing was tougher than normal, although we did end up catching just under 23-pounds on the first day and were sitting in 24th place. Day two got cancelled and so we had to wait until Sunday to finish the tournament. They use Sunday as a rain day in case the first or second day gets cancelled. When we got back on the water it was still pretty rough, but not as rough as it was day two. It turned out to be a very tough bite for us. We went to our prime area where we had caught our fish on the first day but only managed to scrape up four fish. After working it all day I looked at the clock and saw that we only had about 20-minutes of fishing time left since we had a long run back to the weigh-in. So we decided to go to an area where we caught one five-pound fish in practice but didn’t visit on day one. We got there and immediately I lost a heavy fish. Then Derek lost a big fish. This tournament has a six fish limit and we only had four fish in the well. Time was ticking and we still had a fairly long run back when Derek hooks up and lands one about 4 ¾-pounds. Now we’ve got five fish in the well and I’m looking at my watch thinking, man we’ve got to run, we’ve got to get back. So we started running back and, about four-miles outside of the weigh-in, we had 14-minutes left. So we stopped at a spot that didn’t have anything when we checked it in practice but we have caught fish on in previous years and doesn’t Strub set the hook on a 5.83-pounder – number six! I unhooked his bait and put the fish in the livewell, then right away he sets the hook into a 2½-pounder. The smallest one in our livewell was about 2¾ so we put the smaller fish back, fired up the outboard and ran the new Ranger Z522D wide open through the choppy water to get back to the weigh-in. We made it with about 30-seconds to spare and ended up moving into a pretty respectable 15th place out of 171 boats. Once I got home I had to unpack then pack up the pike stuff and head back up to Georgian Bay to finish the show. My brother Wayne and I caught a lot of fish with our guide, Blair, and although we didn’t get any big ones, we did get enough to finish the show off. We caught most of our fish on the new Berkley Cutter 110 jerkbait. These suspending jerkbaits are reasonably priced and they’ve got a great action. Then it was home for a day before packing up for a brook trout and pike trip to Nipigon. I invited my friend John Whyte, from www.timeonthewater.ca and a number of other sites, on this trip. We left in the afternoon on Victoria Day and decided we’d only drive part way up. We got as far as Cochrane that night and did the rest of the drive the next day. On the way up there we got stopped on Highway 11 for about an hour and a half because there were forest fires along both sides of the road in that area. Once we got going again we drove past the smoldering areas on our way our destination at Pasha Lake Cabins. Chad and Michelle Thompson from Wisconsin have had this operation for a few years now and they do a great job running this fishing camp. 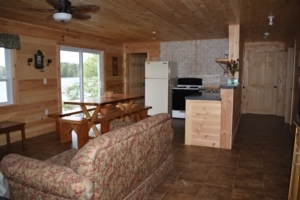 They have a number of cabins for rent and they offer their guests fishing on more than 100 lakes in the area, including big Lake Nipigon. Lake Nipigon has been on my bucket list since I got into this business so I was really looking forward to sampling the fishing there. Most of the guests were concentrating on pike, walleye and brook trout on the smaller lakes in the area and I didn’t talk to one of them who weren’t catching fish. A father and son talked about the 40-inch pike they had caught after they limited out on walleyes that morning; another guy from Wisconsin was telling me how he caught 40 walleyes that day, and another group of guys were talking about the pike and walleyes they caught. It seemed like everybody was catching fish. 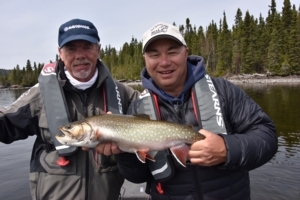 Walleye wasn’t open on Lake Nipigon when we were there so our main focus was on brook trout and pike. In the three-days of fishing we had up there we spent 70% to 80% of our time on brook trout and the other 20% to 30% of our time on pike. We didn’t catch any really big pike but every time we went into pike-looking bays we would catch dozens of fish. But the real reason we were there was for the brook trout fishing. The world record brook trout was caught in the Nipigon River back in 1915. Last year we made a trip to Bowman Island Charters on the Lake Superior end on the Nipigon River and, on my third cast, I caught a 24-inch brook trout out on Lake Superior. Needless to say I was pretty excited to fish at the other end of the river, up on Lake Nipigon. On the first day Chad Thompson hooked us up with guide, Gus Buta. Gus has grown up all his life fishing, both commercially and recreationally. He’s a true outdoorsman who lives in Beardmore, just down the road from Pasha Lake Cabins and he’s got a wealth of knowledge. When I asked him how the lake trout fishing was, he said they average around 20-pounds. He also told me that they have a derby there every year and there’s 40-pound fish caught in Nipigon. He said that at this time of year the fish are scattered but it gets better as it gets later into the season. The brook trout fishing, he said, is amazing, along with big pike and walleye fishing. It’s an incredible and diverse fishery up there. 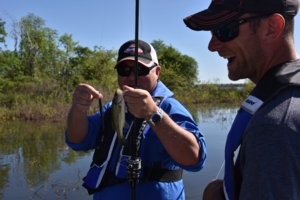 On the first day Gus said he was taking us to a “warm up area” where we would catch lots of 17 to 20-inch fish. Well, John and I ended up going to this warm up area and we caught a dozen beautiful 17 to 20-inch brook trout as well as a few bonus pike. The first three fish that John caught all came by jigging and snapping a little 1/8-ounce jighead with a Berkley Powerbait Twitchtail Minnow on it. I was using a two-inch Powerbait Ripple Shad on a little tiny swimbait jighead that weighed about 1/16 of an ounce. I was casting it out on four-pound Nanofil line with a fluorocarbon leader and it definitely was the winner as it caught the most brook trout that day. We ended up catching a dozen brookies in total and had an absolute riot getting our show shot. We decided to go on our own for the next two days and fish different areas. On the second day we caught brook trout up to 22-inches. My son Darren, who is the camera man, took a break and caught three in a row using a blue and silver Johnson Shutter Spoon. In the space of about 10-minutes he got his personal biggest, a four-pounder, then bested it with a four and a half-pounder and then got another personal best 22-incher that weighed about five and a half-pounds! Needless to say it was an amazing day. The next day we decided we’d go to go to another area about 20-miles away and ended up catching brook trout up to six-pounds. I caught a 22 ½-incher that was around six-pounds, John Whyte caught a 22-incher that was five-plus pounds, we caught another 22-incher, in fact, the smallest fish we caught that day was four-pounds. It was absolutely incredible. I’m glad I got this trip knocked off my bucket list but the problem is, now I want to go back. I’m already thinking of making another trip up there in another two-years or so. I’d really like to sample the walleye fishing there, I definitely want to go after the brook trout again and I want to poke around at some of those giant lakers and pike as well.